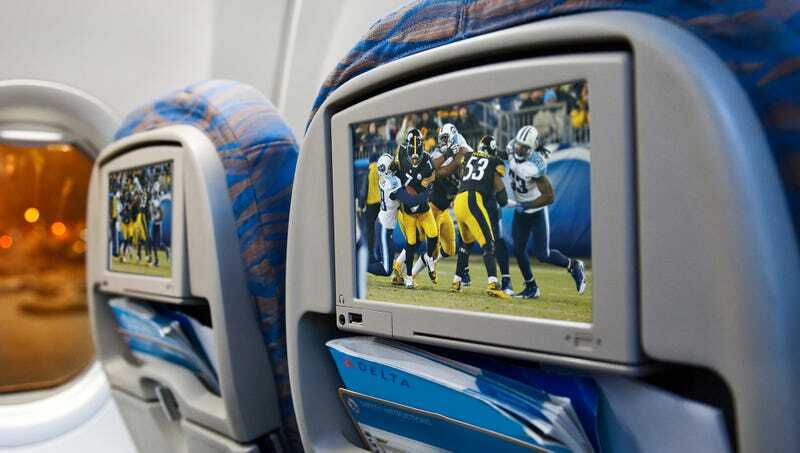 NEW YORK—In an effort to continue delivering games to viewers in new and innovative ways, the NFL announced plans Wednesday to begin streaming “Thursday Night Football” exclusively on Delta flights. “We are thrilled that NFL fans will now be able to enjoy the excitement of ‘Thursday Night Football’ exclusively through Delta’s in-flight streaming services,” said NFL spokesperson Joe Willard, adding that access to every Thursday game can be purchased for a small fee of $2.99 per hour, and will be available on all of Delta’s domestic and international aircraft. “Delta Studios is an industry-leading platform that reaches football fans across the country, and the seat-back screen is a perfect broadcast medium for the NFL. All any fan needs to do is buy a domestic flight ticket, board the plane, swipe their credit card, and then sit back and enjoy that’s week’s Thursday night matchup.” Willard added that “Thursday Night Football” streaming would be blacked out on any flights with fewer than 40 viewers.